Sunday, June 9th, was the first clear, warm day after nearly a week of cold and rain. 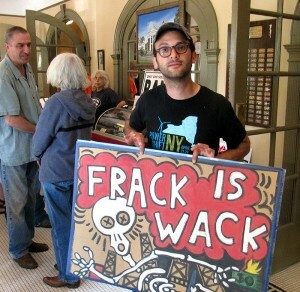 Even so, over two hundred and fifty people came to the Walton Theatre that afternoon to see Gasland Part II, a two hour film, then stayed for another hour to discuss it with the director, Josh Fox. 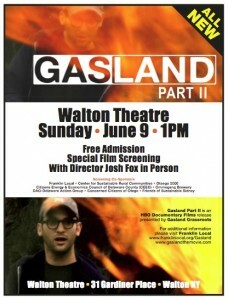 It was almost three years to the day since Josh brought his first film, Gasland, to Walton in 2010. That film told the stories of ordinary people whose lives were suddenly subjected to an invasive and ruinous process called fracking for gas. Gasland went on to win international acclaim and to be nominated for an Academy Award for Best Documentary. I had a chance to speak with Josh, and asked why he felt the need for a sequel. The first Gasland film came out as the Deepwater Horizon disaster in the Gulf of Mexico unfolded. At the time, Josh was struck by the response of the government to that crisis, together with the inability of the media to gain access. Fox brought Gasland Part II to Walton as part of a national grass-roots tour before the film premieres on HBO on July 8th. Gasland Part II is powerful and moving. From the horrifying aerial shots of the oil-streaked Gulf of Mexico, to the wrenching stories of the people struggling on the front lines of fracking, to the shock of Josh being handcuffed and arrested in our Capitol for trying to video a congressional hearing, we begin to see that we are on our own. “It’s hard,” he told me, “to watch your government literally being taken away from you by the oil and gas industry, and that’s what we saw as we tracked these different EPA investigations, DEP investigations, in Wyoming, Texas, Pennsylvania. We follow the New York situation. We follow the frackers as they expand world-wide. We look at climate change––fracked gas is the worst fuel you can use with respect to climate change because methane together with carbon dioxide is worse than coal. “I was playing the Star Spangled Banner on the banjo which I do at the end of the movie as the credit music, and Pete told me that it was the biggest hit of 1814 and it was a bar song and this guy sang it in a bar and they loved it so much that he had to sing it twice and, at four miles an hour, clip-clopping up and down the East Coast, they spread the lyrics around and it became the National Anthem. “This is amazing: if a bar song can become the National Anthem, it says that America is something you’re making up as you go along and that’s what I’m witnessing when I’m watching people fight off the gas industry, these multinational corporations.